Lost Springs -- Wyoming Tales and Trails. Continued from previous page, this page: Lost Springs, Jireh, Shawnee. To the west of Manville, lies Keeline. Keeline originally consisted of merely a fenced pasture and chute for the loading of sheep for the Blain Brothers sheep operation. In 1910 following the passage of the Enlarged Hometead Act, the site was platted by A.A. Spaugh. The town was laid out with four north-south streets and eight east-west avenues. Visitors to the town must have been underawed by the magnificence of the railway station as to which every expense was spared. 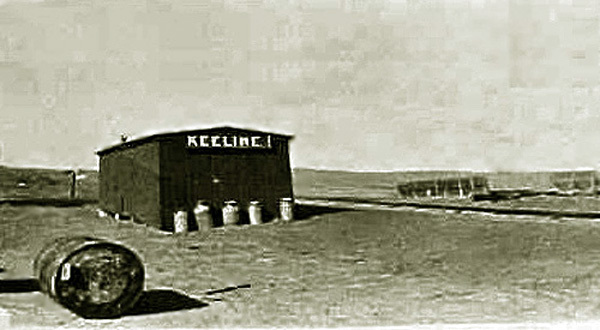 Keeline Railway Station, undated. Note the milk cans next to the station. Actually the purpose of the original siding was to provide a place for shipping milk to the Blue Valley Creamery in Hasting, Nebraska. The Blue Valley Creamery had creameries scattered about the entire United states since there was a limit in the early days as to how far the milk could be shipped. Blue Valley was at one time the fourth largest producer of butter in the United States. In 1939 it was bought out by was was later to become Beatrice Foods. Like Lusk and Manville, Keeline received its start when the Railroad came through in 1886 and was named by Spaugh after George A. Keeline whose ranch was further to the north. 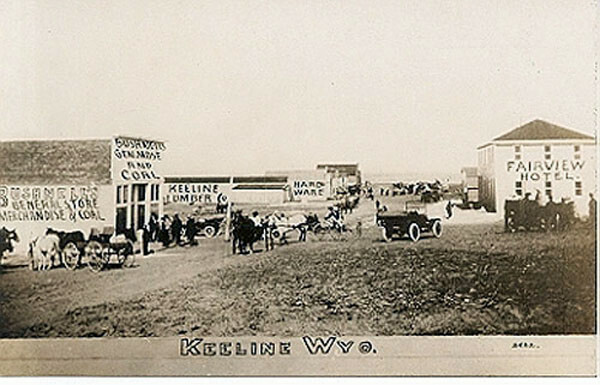 George A. Keeline, originally ran cattle in Colorado in the 1870's before he moved to Wyoming. The Keeline Ranch was headquartered in the Thunder Basin, further to the north. In 1914, Tom blain established the Keeline Lumber and Construction Co., capitalized at $20,000. 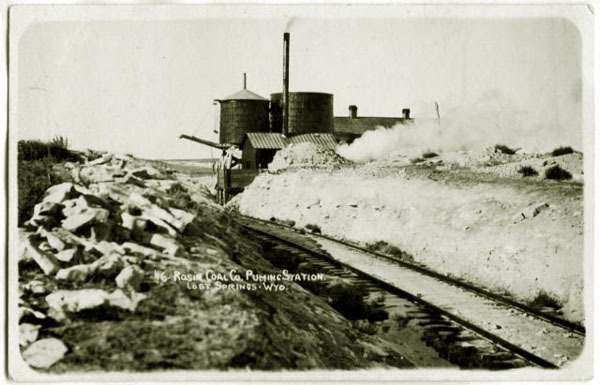 With the advent of dry farming and the petroleum boom, Keeline initially had a fair growth. It achieved a population of over four hundred. It had a bank, a store, a hotel a lumber yard which was capitalized at $20,000, a newspaper, and the Keeline Garage which was a Chevrolet Agency. Nevertheless, the writing was on the wall. The first signs of the fading of dry farming was at Jireh which was regarded as a center of the farming. The Bank had been moved to Keeline in 1917. Petitions were circulated to have the railroad construct a proper terminal. But with the end of dry farming, the little town faded. A visitor in 1921, William E. Barton, described the town as having a population of 100. He spent his two days there engaged in "Industrious loafing admiring the blue sky, the horizon equidistant in all directions except a distant line of hills and the gray wedge of Mount Laramie, a line of cottonwood about two or three miles away, and read a book reclined in a haystack watching out for rattlesnakes. See Barton, Wiliam E.: The Congregationalist, Sept. 8, 1921. Vol 106, p. 309. As indicated by the next photo, little remains of Keeline. by 1986 the population had declined to four and by 1995 the postoffice had closed..
Keeline, 2005. Photo by Geoff Dobson. 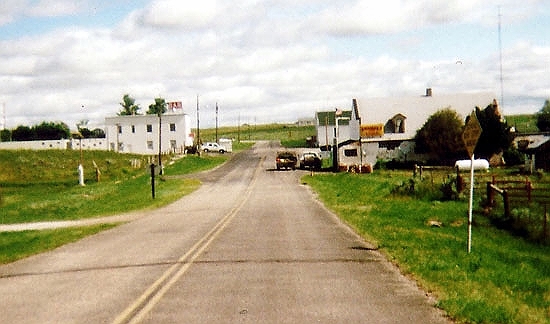 To the west of Keeline in Converse County, lies the smallest incorporated municipality in the United States, Lost Springs, population 1, 4, or 5, depending on who is doing the counting. The 2000 census and the road sign depicted below only reflected 1. It has been contended that that the census taker only counted the mayor and missed the three councilmen. The 2010 census found the missing councilmen and the sign now indicates a population of four. 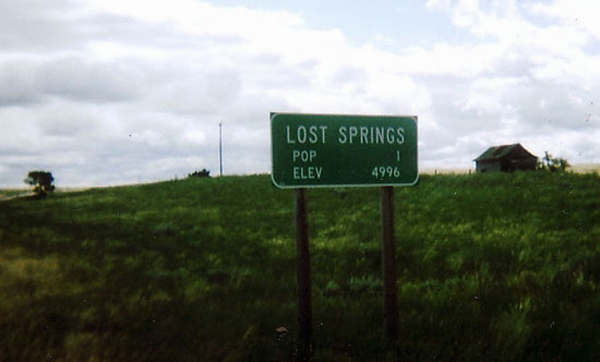 Road sign, Lost Springs, 2005. Photo by Geoff Dobson. At one time Lost Springs had high hopes. 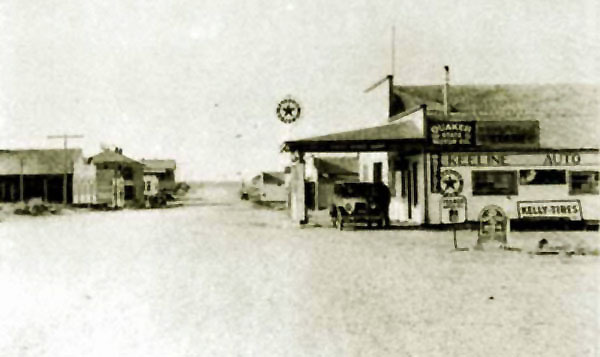 With growth from homesteaders moving to the south of townto taking advantage of dry farming, by 1910 the town had a lumber yard, a post office, saloon, restuarant, and a shooting gallery. A shortline railroad was under construction to connect the Lost Spring Coal Company and the Rosin mine to the main line at Lost Springs. By 1914 a hall was under consruction, A drug store and mercantile had opened. There had been some setbacks. A new hotel was constructed in 1910 but unfortunately burned down in 1911. Nevertheless, soon the town had the Citizens State Bank. The railroad to the mine opened in 1914. The lumber yard was the O. L. Walker Lumber Company. At the time of the photo, the town did not, however, have a blacksmith. By 1914 the town had a newspaper, the the Lost Springs Times. At its peak the town attained a population of about 150. With the completion of the shortline railroad to coal mines about nine miles away, the town was also a shipping point for coal. 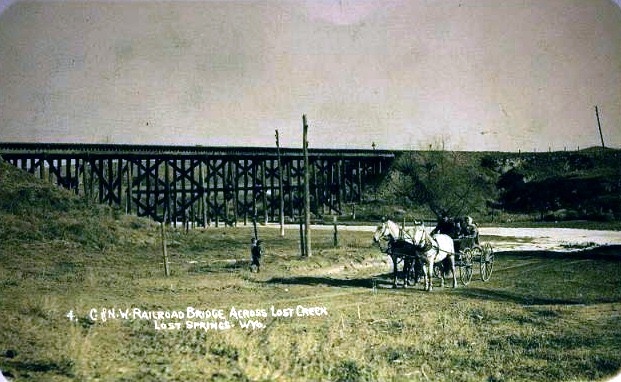 Railroad Bridge over Lost Creek, Lost Springs, 1911. 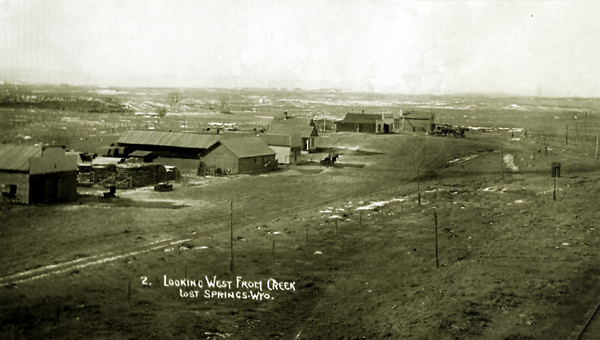 At one time, the town had a population of about 150 and served as a shipping point for the Lost Springs Coal Company. The post office served the area to the south where there were a number of dry farmers. Pumping Station, Lost Creek Coal Company, Lost Springs, Approx. 1910. In 1921, the coal mines were closed and in 1922 the railroad to the mines was abandoned. With the end of the Lance Creek oil boom, by 1930 the population had declined to 65 and by 1940 to 38. Lost Springs, looking south, 2005. Photo by Geoff Dobson. 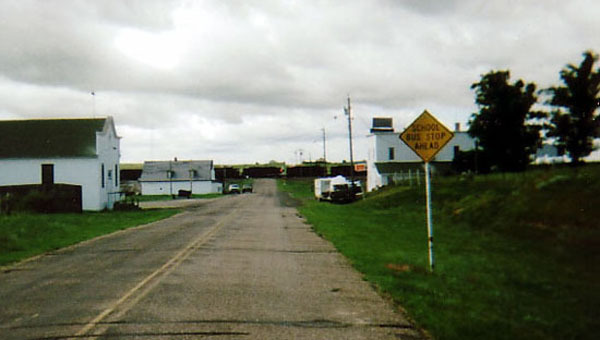 Today, the town consists of the Town Hall, on the left in the above photo; an antique store located in the old bank building further down the street on the left; the "Lost Bar" saloon on the right, open on major holidays and during hunting season; an outhouse; the old jail (not occupied during the past 40 years); and several other buildings in varying states of decrepitude. The coal train in the distance was over a mile long and had two locomotive in the front and a pusher at the end. Lost Springs, looking north, 2005. Photo by Geoff Dobson. The two story building on the left is the Lost Bar. Behind it are several trailer houses. On the right is the post office, antigue store, and the Town Hall. As a word of explanation, Wyoming provides revenue sharing to its municipalities. Thus, Lost Springs receives funding from the state which has paved its main street and helps to pay for the garbage service. The town was allegedly named by railroad workers who were unable to find a spring shown on their maps.